Today, we’re looking at Garchomp (SM Forbidden Light 62/131), which is a alternate typed Garchomp that was based on SM Ultra Prism 99/156. This one is a Stage 2 Fighting Type with 150 HP, weak to Grass, and free retreat. Quick Dive costs CC and does 50 damage to one of your opponent’s Pokemon. Royal Blades costs FCC for 100 damage, plus 100 damage if you’ve played Cynthia during your turn. 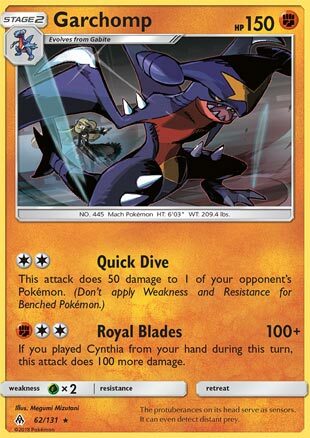 The Cynthia card in question is the one from Ultra Prism that has a identical effect of Professor Oak’s New Theory, which shuffles your hand into your deck and then draw six cards. Such a brilliant effect gives it a reason to be used, even if it means giving up using other Supporters other than Cynthia. Guzma can be substituted for Counter Catcher or Pokemon Catcher. Another combo card that pairs with Garchomp is Lucario (SM Ultra Prism 67/156). Its Precognitive Aura lets you search your deck for a card if you have a Garchomp in play. With multiple Lucario in play, you could potentially search your deck for up to four cards! So which one is better? The Dragon type or the Fighting Type? Well, Dragons can only hit for weakness against BW-era Dragons while the Fighting Type can hit weakness found on Colorless, Lightning, and Dark Pokemon. The Fighting Type Garchomp can be searched via Korrina or Maxie’s Hidden Ball Trick, as well as boosting damage output via Strong Energy and Diancie Prism Star. So the Fighting Type has a lot going for it than the Dragon type, and thus would be used more frequently than its original counterpart. Still, it doesn’t hurt to mix those two Garchomp cards in case your in a unfavorable weakness (Grass or Fairy). Garchomp (FLI 62) bites its way back into the format in the Forbidden Light expansion set. This Pokemon card is almost an exact replica of the Ultra Prism version except that it’s a Fighting type. It’s HP is the same, attack cost is the same, retreat is the same, the only difference is that it’s Fighting and now has Grass weakness. Man, I thought this was going to actually be good as a Fighting type. I thought it might even be better than Buzzwole since it wasn’t Psychic weak. But after 31 games and five different variations, I’m throwing in the towel. I’ve gone 9 W 22 L in those 31 matches. Here is the list that I had the most success with, a less than mediocre 5 W 7 L.
I really thought it would be able to take advantage of Strong Energy and Diancie Prism and those would put it over the hump it had as a Dragon type. I thought it would be very good, hitting not just for 200 or 230 with Choice Band but possibly 220 or 240 with just a single Strong Energy and no Choice Band to worry about finding. And those Choice Band slots might open up availability to help include a couple more consistency cards. And some games it did – with the list above I was 2 W 2 L against Buzzwole, and even in many of the losses, it was very competitive. Many matches would come down to the loser only having one or two prizes left. Overall, however, Garchomp was just very disappointing, and I certainly couldn’t get it to win more than it lost. And it’s somewhat to be expected – at this point of the season, the best decks are too fast and over powered for a Stage 2 deck to be competitive. However, I don’t think this deck loses too much post rotation, and I’ll definitely be giving it another go in September. I will close with this: I faced Garchomp 74 times between February and April. In the little more than a month since FLI, I have only gone up against Garchomp 15 times. Where did all the Garchomp players go? Why did everyone who was so in love with the archetype abandon it after it actually became potentially playable? Of those 15 matches post FLI, only THREE of them have been against Garchomp FLI!!! It is the most bizarre stat I have encountered this year. I have absolutely ZERO explanation for why the majority of people who are still playing Garchomp are still playing the inferior version!